Quick update before the weekend. | love lives on. Someone once told me that deep grief is the price you pay for great love. To that I say, this grief I feel, is worth it. Every ounce of it. I don’t want to write about Melvin right now, I don’t even think I could. What I will tell you is that even though there is sadness and tears, there are also many more moments when I feel Melvin wrap his love around me and I smile and I feel strong and I’m reminded to try to live life the way Melvin did. He always leapt forward, keeping one eye on the joy and the other eye on me, making sure I was coming along for the ride. Love leaps on. Jake is mourning the loss of his brother. Even though Jake has barked a total of 20 times in two-and-a-half-years, he now barks all throughout the day. (And just so you know, Jake has a bit of a Barry White bark, it’s not he bark you’d expect to come from his body). He has been looking for Melvin in every room, corner and closet. When he does this, I try to redirect his energy, like I decided it would be a good idea to try a bath. I know a lot of you bathe your dogs at home and I’m in awe of your confidence. We all have our strengths, bathing others is not one of mine! I decided to bathe Jake in the kitchen sink with no thought of how to reel him in when he started flailing, mostly because I didn’t expect him to flip-flop around like that. He managed to get water 20 feet away from the sink. Somehow we survived and he ended up clean in the process. But to Jake it probably seemed a lot like this: Monday, someone took my life partner away and Tuesday, my mother tried to waterboard me. In other news, it turns out that Jake does not know a single command. Not one! He was 100% following Melvin’s lead. If I said ‘dinner’ and Melvin came running, Jake was the monkey of ‘monkey see, monkey do’. In fact, whenever I say anything to Jake now, even the word ‘sit’, he looks around for Melvin to decipher my words. So now my little cheater is learning his own smarts. Have a great weekend! We wish you much joy! Check back early next week for an AWESOME treat from Yellow Brick Home to Oh Melvin readers! Lastly, thank you, for so many things. Each and every one of you, thank you. We are certainly holding each other up. Thanks! Someone also told me that when I lost my dad… and there could not be another statement in the English language that holds more truth. But, great love is priceless no matter how deep the pain of grief. Your posts never fail to make me laugh… even when there are tears in my eyes. I love that saying. I reminds us to put love into the moment, so we recall why it must hurt so bad. The first day or two I just thought he was ignoring me. But even things that benefit him, like the word ‘kong’ and ‘treat’, he just looked at me like was speaking pig latin. The word bath will forever scare him! Oh Tracy, you guys have been on my mind all week. You’re such an amazing mama, and I know Jake feels your love. I have no doubt Melvin is looking down on you both and constantly wrapping his love around you. Hang in there, and hugs to you both! Sending heaps and heaps of love to you and Jake. I’m thinking of you both so much. Laughing and crying, laughing and crying. You are so genuinely funny and raw at the same time. Thinking of you. Laughing is good for the soul! You express everything so well. I understand Jake. I had a twosome like you had and when one was lost the other called Happy whined for almost a year off and on. As a little rescue dog she had a lot of loss in her life and when she lost Pharaoh, her big adopted brother she could barely stand it. Thank you for your posts. I love reading them. You and Jake will survive and like you say, the love is worth it, even in the heartbreaking end. A dog named Happy should never know sadness, I’m sorry she had to face that. It’s hard when they don’t know what happened. It’s hard knowing what happened to. Oye! I read the first paragraph and feel my chin quiver as if I’m going to cry any moment….But then I’m laughing about Jake and all is right with the world again. 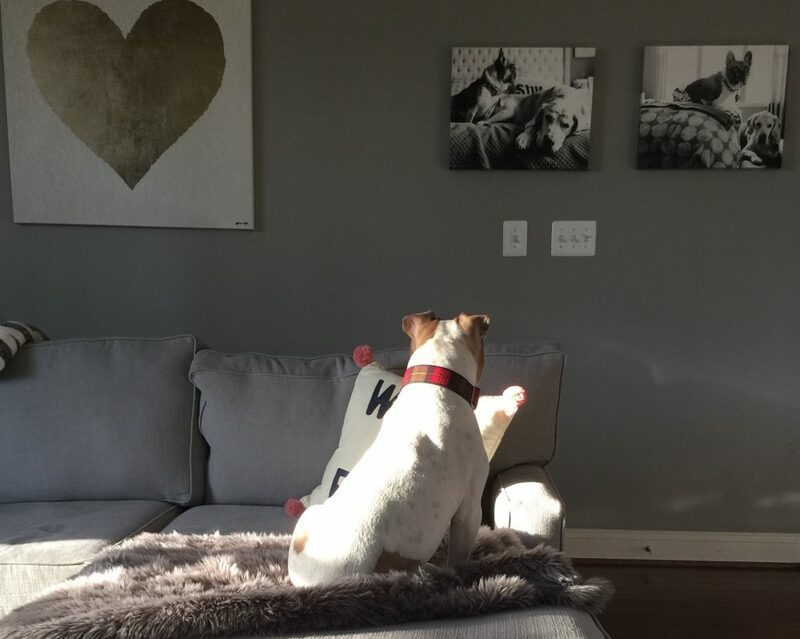 But then….BUT THEN…..I see the pic of Jake on Melvin’s bed and now I’m in a full blown ugly cry (at work)! Sending you all love and hugs! We need to get your address and send you some tissues for your desk! Tracy you and Jake you have been in my thoughts all week. I just want to take a moment and tell you Thank you for sharing you family, feelings and wonderful stories with us I will never forget your beautiful Melvin. I understand Jakes reactions to your loss, it’s been two months now that our sweet little DannyBoy crossed the rainbow bridge and still everyday our other two dogs look for him, and our Pit Mona Moo still cries you can see the tears on her face and it makes things so hard. I had been do real good only crying on occasion, but then the other day I let them out to potty and I had to go back in to get something and when I came back out JackBlack was sitting on the porch waiting for momma to come back out side and Mona was no where to be found, so……..I called and called and called some more and still no Mona. So I put Jack back in the house and started for the field behind the barn where Mona likes to chase bunnies….this is also where we buried our DannyBoy and three others we have lost. I came around the corner of the barn and could see Mona now…..she was over by the cross that makes each site and she was laying on Danny’s spot so I hurried to her and she was whining and you could see the tears roll down her face. So together we sat in the grass and cried for our Danny, we sat there for a good twenty mins and then she got up off my lap and started back to the house. She has been better the last couple of days, but the reason I tell you this story is to show you we all need our time to grieve and we all do it differently. The pain will always be there but it will not always be so bad, it just comes with time. Jack still sleeps with Danny’s baby it’s a chewed up squeak fish but that is how he is dealing and Mona, well she did her thing but that is how they are grieving. You are such an amazing woman and God and Melvin will watch over you and Jake. Although it will take time it will become easier. I keep you in my thoughts and prayers daily stay strong and remember the good times and that Melvin is with you everyday watching over you. Thank you for reading my story and sharing all of yours. God Bless you! Jody…thank you for sharing this. I have been sitting here visualizing this moment you had with Mona. It seems like it was a moment you both needed to share together, I love her for going to that spot and maybe even knowing she was leading you there. I wish we got cards when we got the dogs and we could trade them in to find out what they are thinking at key moments in their life. But alas, love is our language. Seems to me you speak it beautifully. I’m sitting in the Starbucks drive-through with a lump in my throat feeling heartbroken for you, then chuckling at funny Jake. I’m so sorry you guys are mourning, it’s so hard. And there are just no words or anything they can make it better. I hope the Starbuck treat washed away the lump! Thanks for reading along. Time to get to work, Jake. 😛 Have a great weekend, Tracey. Yes, this weekend we conquered ‘sit’! Jake is such a sweetie, i’m sure he’ll pick up on some words pretty quick. Thank you! He’s somewhat enjoying learning words, since treats usually follow. 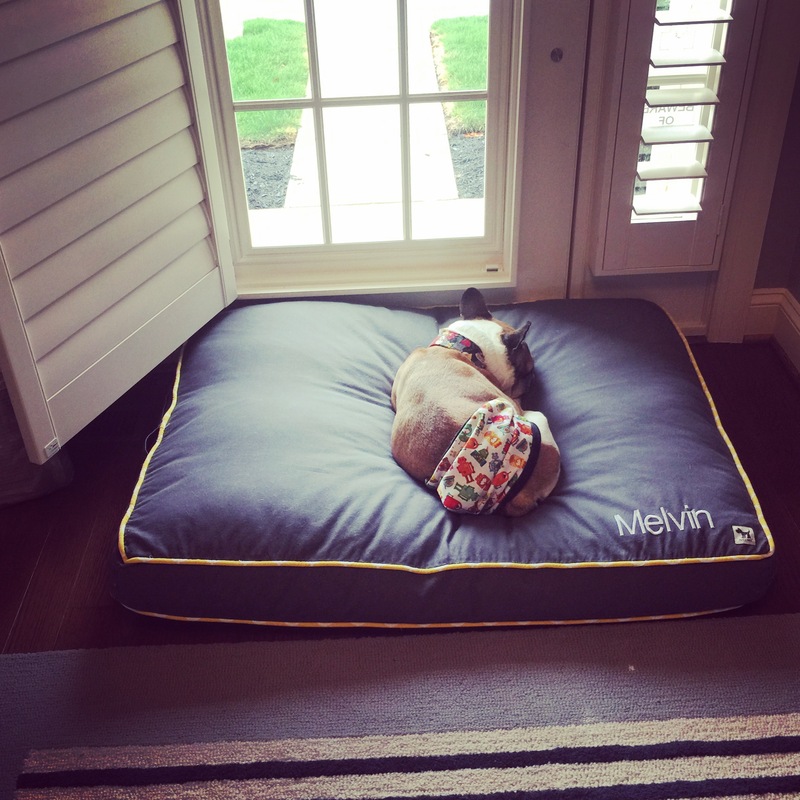 It made me happy to see him on Melvin’s bed. I mean it’s heartbreaking, but he was able to sleep and relax and snuggle something that smelled like Melvin. my heart aches for you and Jake…the pic made me choke up and run and hug Silly and Moo. Wishing you both strength and love to see you thru the grief. I hope you hug Silly and Moo for us too! He is definitely seeking out all the items that smell like Melvin. I’ve lost two of my three in the last 10 months, and it really is sureal to see our surviving pets in a new light. I realized my guy is smarter by himself than he was as a pack. In fact your cancer journey with Melvin describes my cancer journey with Charlie. God speed Melvin. Krissy, I can’t even begin to imagine losing two so close together. I’m so sorry. Hopefully Charlie and Melvin are tearing it up together. Hugs to you both. The first weeks of quiet are the most difficult, I think. It’s so true. Jake is pretty noisy, so there is that! Hugs to both of you. Melvin will always be with you both in spirit.